I'll have to begin by making a confession. I was never a fan of the Skoda Rapid, mainly for the way it looked. 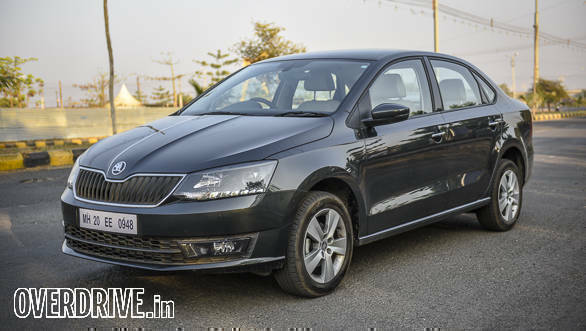 The Fabia-inspired front end simply did not gel with the rest of the car, and I couldn't see a reason why one would want to pick up a Rapid instead of its handsome cousin, the VW Vento. 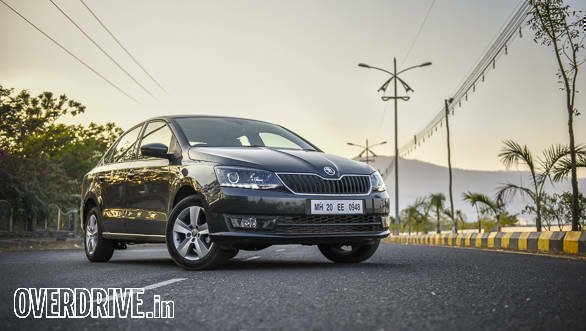 Skoda India has been listening and has given its mid-size sedan first proper facelift in five years. So what's it all about? You won't go wrong in thinking that the new Rapid looks like the offspring of the new Superb and Octavia, when viewed head on. The new face is sharper and sleeker than before, and it finally looks like it belongs to the rest of the car. I liked the new headlamp cluster too. The double-barrel set-up gets projectors for the low beam and a multi-reflector unit for the main beam. Below these are the LED DRLs that look great and add to the premium look of the car. The front bumper features a larger air dam with a honeycomb effect and new oval-shaped fog lamps, encased in a rectangular glass cover. The side profile again appears sharper, thanks to the shape of the bonnet. However, past the A-pillar and all the way to tail, it is identical to the previous model. The rear bumper gets minor changes while the boot gets a thin chrome strip at the bottom and a neatly integrated spoiler at the top. I wish Skoda would've replaced the conventional bulbs in the C-shaped tail lamp with LEDs. 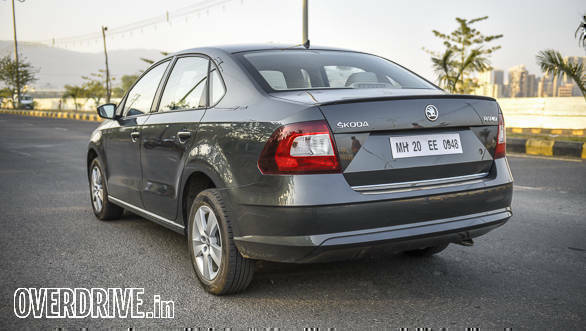 Look at the Octavia's or the new Superb's tail lamps and you'll know what I'm talking about. That said, the new Rapid looks really good. Think of it as a college kid who's chucked his Vans for a dapper suit for the college prom. That's how improved the looks really are. 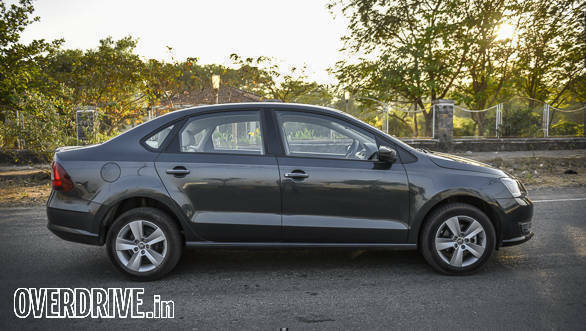 Since this is a VW Group car that shares its genes with the Vento, build quality and impeccable fit and finish are a given. In this new carbon steel shade, the car looks sophisticated and I must say paint finish is indeed a benchmark for the competition. 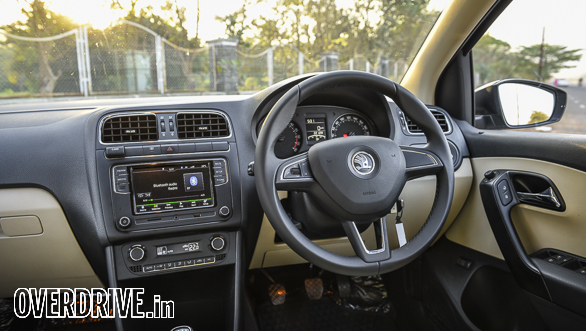 Inside the new Rapid features a similar layout to its predecessor; however, Skoda has improved the equipment levels to bring the car at par with the competition. The 6.5-inch infotainment system is new and easily one of the crisper units around. The touchscreen's sensitivity is far better than what you experience in competition, like the Maruti Suzuki Ciaz. Pairing your smartphone is easy, and you can use the MirrorLink feature to simulate your phone's screen on the infotainment system's display. The new steering wheel looks good and is one of my favourites among the updates. The chunky leather-wrapped steering rim feels good to hold, and the buttons on it are quite intuitive to operate. I also feel the scroll-type button to adjust the volume is another thoughtful touch. 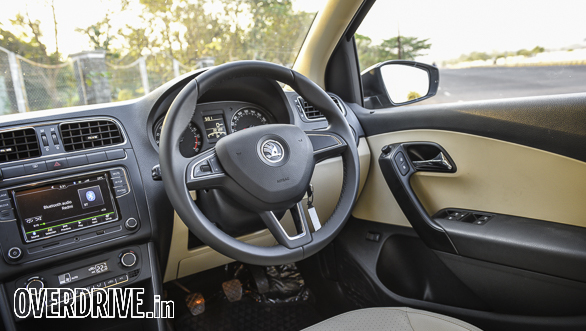 Skoda has opted for an ebony/beige combination to upholster the cabin and it looks quite neat. There are other noteworthy features too, such as an auto-dimming rear-view mirror, climate control, cooled glovebox, cruise control and remote-operated power windows. Skoda could have got the extra mile and offered a reverse camera to complete the equipment list. The front seats offer decent levels of comfort; however, a little more underthigh support would've been welcome. The rear bench is comfortable and you won't really want to be chauffeured in the car. That said, cars like the Ciaz or City offer far more space, and if you are looking solely for rear space, the Rapid doesn't fit the bill. The 460-litre boot though is generous and is enough to haul your shopping or weekend luggage. The new Rapid's 1.5-TDI motor is an updated version of the same engine that powered the previous Rapid. It gets a new turbocharger which results in an increase in power from 105PS to 110PS at 4,000rpm. 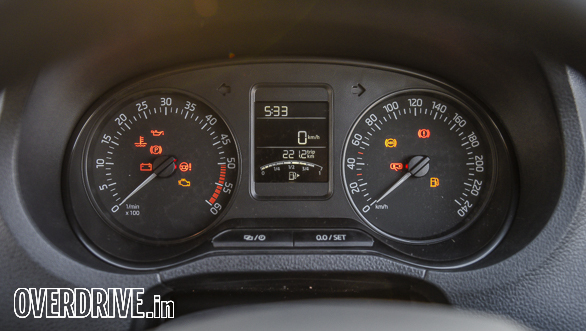 Its torque rating at 250Nm, between 1,500-2,500rpm, remains unchanged though. We have the 5-speed manual variant on test, but you can also option this engine with the 7-speed DSG box. The engine is remarkably free revving, and what it really stands out for is the driveability. 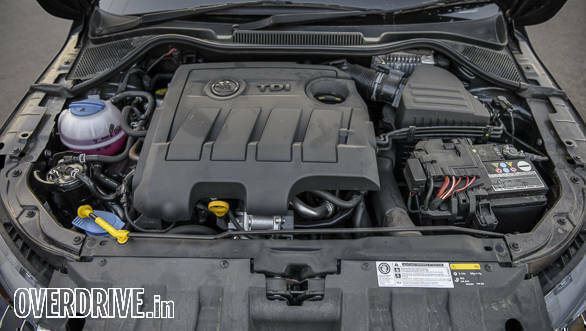 There's ample amounts of torque as soon as you release the clutch, which means you can potter around in congested city environs in second or even third gear. For instance, I could easily hold 25-30kmph in third without any signs of protest from the motor. 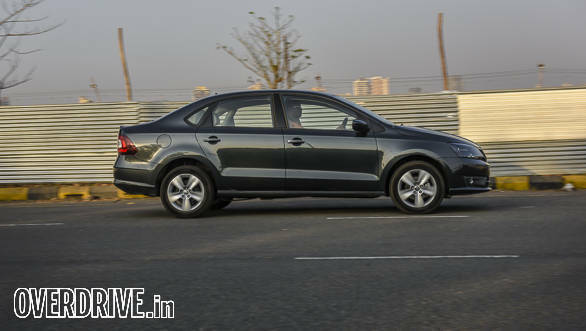 The 5-speed manual offers short and precise throws, and I actually liked working up and down the gearbox. The clutch though is a tad on the heavier side but isn't really a deal-breaker. The motor, in fact, is so torquey that cruising in fifth gear at anything above 50kmph (with the revs hovering around the 1,200rpm mark) is possible without straining the engine. There's also a nifty gear position indicator on the MFID in the instrument panel that also prompts when to upshift or downshift. Follow what it suggests and you'll be blown away with the efficiency of the motor. The Rapid returned 14.33kmpl in city and a mind-boggling 23.05kmpl on the highway. Get past 2,000rpm and the turbo kicks in, sending another tidal wave of torque. The car is propelled 0-100kmph in 10.9 seconds which is quicker than most of the competition. There are no changes to the suspension set-up of the Rapid, and we have no complaints since it always offered a good balance between ride and handling. Low-speed ride is a little firm; however, ride quality improves as speeds rise. The car is planted around corners, and there's good grip and feedback from the chassis. I also appreciated the high-speed stability of the car. It feels secure much like cars from a segment or two above. The combination of a strong motor and good highway manners makes it an effective and efficient mile muncher. 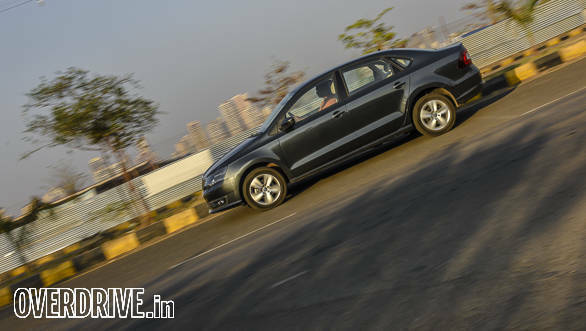 At Rs 14.29 lakh on-road Mumbai, the Skoda Rapid diesel is quite appealing. It looks contemporary. The quality is tangible and fantastic, and the engine is brilliant. It's also a good driver's car and if that's what you are looking for in your mid-sized sedan, the Rapid makes for a strong case.